Yesterday, a friend (who knows I like collecting such things) gave me, as a farewell gift, the little booklet you see here. 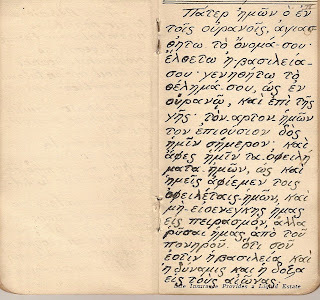 70 years ago, in 1938, someone carefully wrote in it the Lord's Prayer in 12 languages: English, German, French, Spanish, Italian, Latin, Yiddish, Gaelic, Koine (NT) Greek (see other picture), Polish, Russian, and Esperanto. I think he wrote it in 12 languages to reflect the catholicity of the church. Christ sent the apostles out into all the world to preach the gospel in every language. 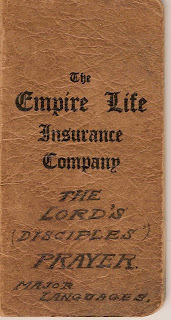 I think he wrote it in an "Empire Life Insurance Company" booklet because prayer is the best insurance policy we have. I think the final translation is in Esperanto because it was supposed to be the universal language that would bring people together. I'd love to have met this guy. What a wonderful gift from a thoughtful friend!